This page is devoted to pulmonic ingressive phonation/speech, i.e. sounds produced on pulmonic (lung) airstream. This page is constantly updated as new sources appear. Most of what I have found out about ingressive so far is accounted for in the journal article published in the Journal of the International Phonetic Association (JIPA) listed below. Section 3 below accompanies the JIPA article (2008), and besides sounds files that correspond to the eleven spectrograms in the JIPA paper, a contents list is provided in order to provide a general overview of what the paper covers. Contributions are encouraged and welcome. Pulmonic ingressive speech is when speakers produce language – sounds, single words, or even entire phrases – while breathing in. A common notion is that this is typically Scandinavian, but after spent eight years perusing approximately 500 works that mention ingressive speech, and span from 1657 to the present day, another picture emerges. Ingressive phonation has been used as a deliberate means of speech or sound production for hundreds of years in order to achieve specific effects, and it is still used for the same purposes, by e.g. shamans and ventriloquists. In normal spoken and spontaneous conversation – contrary to what is often claimed – present-day ingressive speech is not limited to Scandinavia or Nordic languages, but is instead found on all continents, in genetically unrelated languages. Where ingressive speech occurs, it serves more or less the same paralinguistic functions, such as a feedback marker in a dialog. Since pulmonic ingressive phonation is also common in the calls of monkeys and apes, thus exhibiting a biological basis, Eklund (2007;  below) suggests that ingressive speech might constitute a neglected universal phenomenon, rather than being “highly marked”, which is how it is commonly described in the literature. 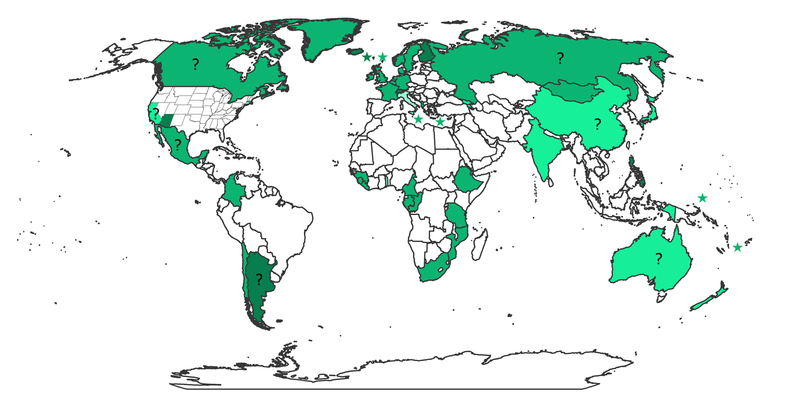 The map below — taken from Eklund (2007, p. 23; see below) — shows the distribution of ingressive speech in the world. New sources are constantly being found, so the map will change over time to include new countries and regions. Basic map template created by and courtesy of Ljuba Veselinova, Stockholm University, Sweden. Click on the map for a high-resolution version. Most recent update: 22 July 2015. Ingressive phonation mentioned, for e.g., pain or surprise. Paralinguistic sounds used, e.g., Japanese hiss. Single words are pronounced ingressively, e.g., Swedish “ja”, “jadå”. Entire phrases are produced ingressively, e.g., Argentine Spanish “un trabajo matador”. 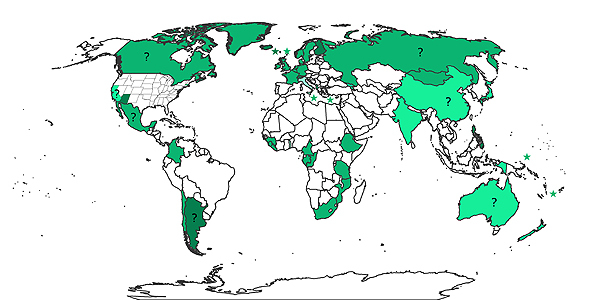 Star symbol used for areas too small to be filled in (e.g., Malta, Vanuatu, Faroe Islands). Sources unclear/not explicit whether entire country/region is implied. This section accompanies the 2008 JIPA article, i.e. publication . Basically, it provides the sound files that correspond to the eleven spectrograms in the paper, and also includes a contents list of the paper – which is not part of the paper proper. Elert (1989) for Spanish; and Sandra Clarke (p.c.) for Swedish. for Spanish; and Elert (1989) and Sandra Clarke (p.c.) for Swedish. Below are the figures that appear in the JIPA paper, and the sound files that are the basis for the spectrograms. The linguistic items that are produced ingressively are marked with a red font. Here are a couple of sound files that include ingressive affirmations, the Swedish word “ja” (yes). Please click on the spectrogram images for larger and clearer versions (open in new browser window/tab). I intend to put sound samples from other languages here in the near future. Thanks to my former colleague Annika Voss for allowing me to use these sound files (that were recorded for completely different reasons). This section is a condensed version of my research on purring and ingressive phonation in felids and other mammals. For full versions, with audio and video files, as well as a full bibliography, please see either http://purring.org or Wildlife Research page. Pulmonic ingressive phonation is not exclusively used by humans but is encountered in the phonation of many animals, as observed by e.g. Charles Darwin in 1872, and Charles Robin Segond (1848) lists dogs, foxes, cats, horses, donkeys and birds, for example. It has also been pointed out that frog calls and several monkey and ape calls make use of ingressive phonation (see 3.2 in my JIPA paper). About the time the JIPA paper was published I turned my attention towards wildlife conservation in general, and big cats in particular, which implied perusing the literature from a different angle than when researching the literature from a phonetic-acoustic perspective. Very soon I realized that Dr. Gustav Peters had done extensive research on purring – one can probably say that his research on purring parallels mine on ingressive phonation and speech, implying some overlap – and Dr. Peters has kindly provided me with sound files, contacts and references, which is hereby gratefully acknowledged. 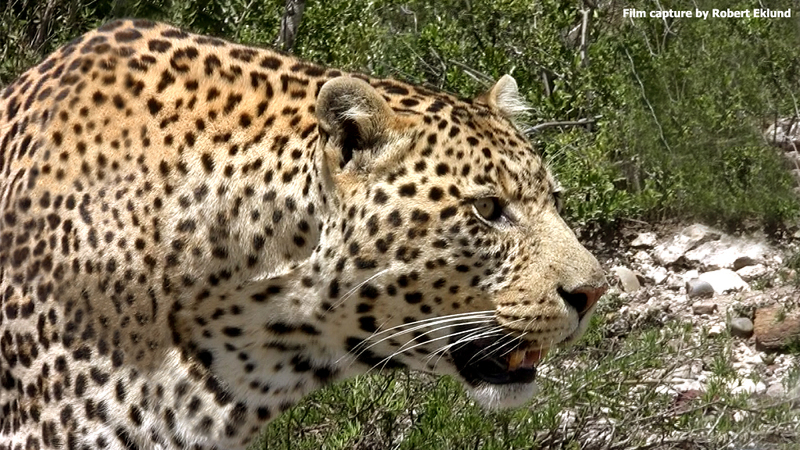 While the leopard (Panthera pardus) does not purr (no roaring cats purr) it still produces sounds that are made partly on ingressive airstream, including the so-called “sawing” sound. Here are my own publications on ingressive speech. The numbering is the same as the one found on Robert Eklund’s homepage (click on Publications). In: Proceedings from Fonetik 2015. Working Papers 55/2015, 8–10 June 2015, Centre for Languages and Literature, General Linguistics/Phonetics, Lund University, Lund, Sweden, ISSN 0280-526X, pp. 31–34. In: Robert Eklund (ed. ), Proceedings of Fonetik 2013, the XXVIth Swedish Phonetics Conference, Studies in Language and Culture, no. 21, 12–13 June 2013, Linköping University, Linköping, Sweden. ISBN 978-91-7519-582-7, eISBN 978-91-7519-579-7, ISSN 1403-2570, pp. 25–28. Gothenburg, Sweden, May 30–June 1, 2012, pp. 41–44. Pulmonic ingressive phonation: Diachronic and synchronic characteristics, distribution and function in animal and human sound production and in human speech. Journal of the International Phonetic Association, vol. 38, no. 3, pp. 235–325. Download from Cambridge University Press. Pulmonic ingressive speech: a neglected universal? Proceedings of Fonetik 2007, TMH-QPSR, vol. 50, 30 May – 1 June 2007, Stockholm, Sweden, pp. 21–24. Från oraklet i Delfi, via (andra) shamaner och engastromyther, till norrländska dammsugare. En exposé över tal på inandningsluft. Ingressive Speech As An Indication That Humans Are Talking To Humans (And Not To Machines). Proceedings of ICSLP’02, 16–20 September 2002, Denver, Colorado, vol. 2, pp. 837–840. I appeared on the Swedish public broadcasting program Språket (“The Language”) on Tuesday, 31 October 2006, where the program hostess Anna Lena Ringarp interviewed me about ingressive speech, believed by most Swedes to be a very Swedish phenomenon. “My” part of the program can downloaded below. I suffered from a tremendous cold at the time, but I still think I can be understood (provided you know Swedish, of course). The JIPA paper includes an extensive set of references (c. 480 entries) to works that treat ingressive phonation and speech from a wide variety of angles, beginning with Van Helmont (1657).